Celtic will play Champions League debutants Braga in the third qualifying round of the competition. Braga finished second in the Portuguese first division last season, and Celtic will play the first leg away on 27/28 July before the home tie on 3/4 August. Liverpool will face the unfamiliar Rabotnicki from Macedonia or Armenian side Mika in the Europa League third qualifying round. The Premier League outfit will play on 29 July at home and away on 5 August. The winners from the third qualifying round games in the Champions League and Europa League will then face a two-legged play-off to get into group stages of their respective competitions. 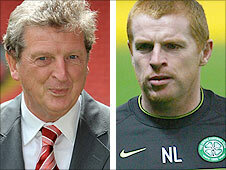 Will Roy Hodgson be a success at Liverpool? Irish side Bohemians currently lead Welsh club The New Saints 1-0 after the first leg of their second round Champions League qualifier, and the winner will play Belgian club Anderlecht. Elsewhere in the Europa League, SPL side Hibernian have a tie against Videoton of Hungary or Slovenia's Maribor, while the opponent of fellow Scottish side Motherwell will face Norwegian club Aalesund if they beat Icelandic league leaders Breidablik. Dublin outfit Shamrock Rovers could set up a glamour tie against Italian side Juventus if they can overcome Israel's Bnei Yehuda, with their second round qualifier locked at 1-1 ahead of the return leg in Tel Aviv. Cliftonville have a potential tie against CSKA Sofia if they can beat Cibalia and Northern Irish counterparts Portadown have been drawn against Siquliai or Wisla Krakov if they defeat Qarabag. Welsh side Bangor City will have to play Maritimo or Sporting Fingal if they can negotiate their way past Finland's Honka Espoo. The first leg of Liverpool's qualifier will be new manager Roy Hodgson's first competitive game in charge of the club following him taking over the Anfield hot-seat after the departure of Rafael Benitez. Hodgson left Fulham to join the Reds and his last game for the Cottagers was in last season's Europa League final when his previous side lost to Atletico Madrid in extra-time.